Three things are crucial when it comes to using modern day technology for business: speed, accessibility, and multitasking. Modern day businessmen want to do most of their work on the move, combining all their devices and using their full potential. Home PC, office PC, notebook, handheld devices, phones – all connected and synchronized for better usage. There are plenty of software solutions for multi-platform integration. And business use is only the top of the iceberg. Using it to help a friend manage their PC is one option that can always come in handy. While connecting your handheld devices is a good way to play a movie from the couch without standing up, the two-PC connection is the advanced way to enable all the features – just like you were sitting in front of it. To do this, simply install host and client software on specified PCs and it is done. In a few steps, you can take full control of the given PC do whatever you want. We’ll list a few of the best Windows 10-compatible PC-to-PC remote access programs to introduce you to the dazzling potential they have. Some of them are easy to install and are mainly for everyday use, others are advanced tools and offer better performance in professional environments. 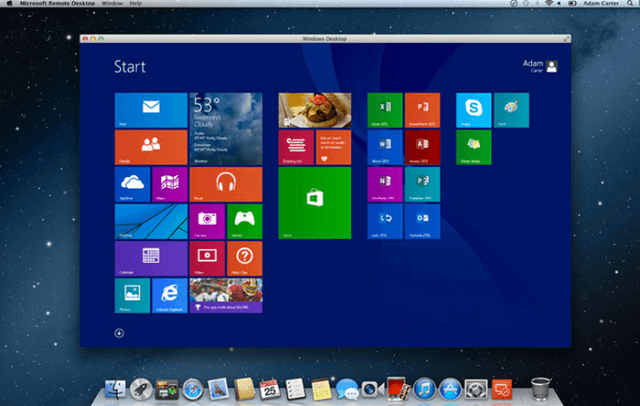 Remote Desktop is a built-in remote access software for the Windows OS. It dates from Windows XP, and the new OS versions of Microsoft platform haven’t seen too many upgrades. That is the case with Windows 10, as well. But, while not as versatile as the other tools from the list, Remote Desktop is easy to use and will satisfy your basic needs. As it’s already installed, you just need to allow remote connections on your PC on the host device. Client device just needs to enter the host IP address and that is it. You can easily work on the client desktop, use its data, print files or transfer a clipboard data. 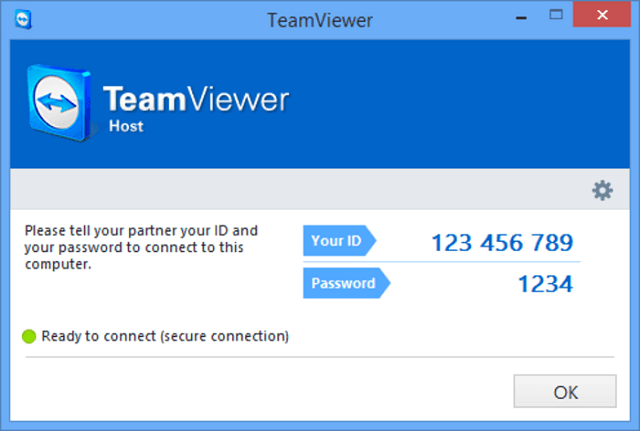 Team Viewer is probably the most popular remote access tool available. It’s freeware so you can obtain it with the simple download. The best thing about Team Viewer is its multiplatform presence so you can use it on almost every device in your possession. Installation is easy and setting it up is not hustle at all. Host and client sides can easily connect by installing Team Viewer and inserting 9-digit ID. After that you can reboot client PC in Safe Mode, transfer files even from cloud storages, can start and join a meeting, have text and voice chats and much more. There is also support for multiple monitors. You can download Team Viewer from here. AeroAdmin is, comparing to many others remote access tools, the easiest one to use. Although there is no chat option, this program is one of the best for instant access to other PC. With an interface similar to Team Viewer, AeroAdmin can easily connect to the another device by sharing IP or entering ID. You can choose from the two different connection modes: View Only or Remote Control. The best thing about AeroAdmin is that it’s portable so it can be launched from USB and get to work swiftly. Both personal and commercial uses are free of charge. 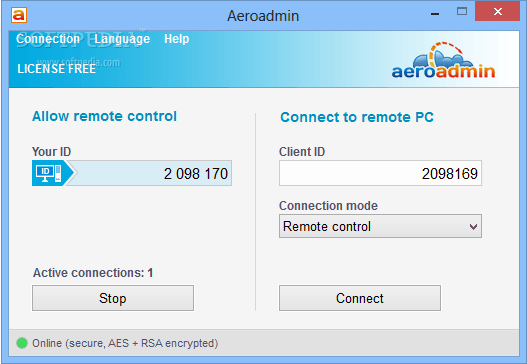 If you are looking forward to good remote access tool, download AeroAdmin from here. 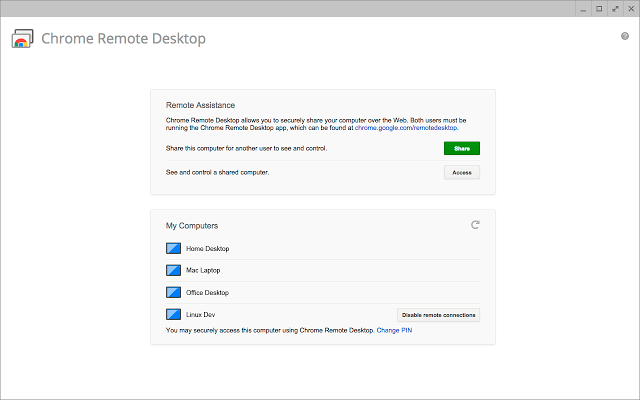 Chrome Remote Desktop is the browser extension that lets you remotely control any other computer with the same extension. You won’t find the abundance of options but it’s easy to install and all functions in borders of Google Chrome. Therefore, you can use it with any system that supports the Chrome browser. Just login to both host and client sides and enter the PIN. After that, you ‘ll have the insight in host PC with limited but useful options. Data transfer and PC control are most used ones. While others programs on the list have more options, Chrome Remote Desktop is a viable choice for basic use and easy setup. You can get download free version from here. Comparing to the previous programs, this one, even with its free edition, is quite a capable tool with many options. The connection between two PCs is done with the Shared Password, a generated digital ID. ShowMyPC is a portable program so you can run it from the USB. 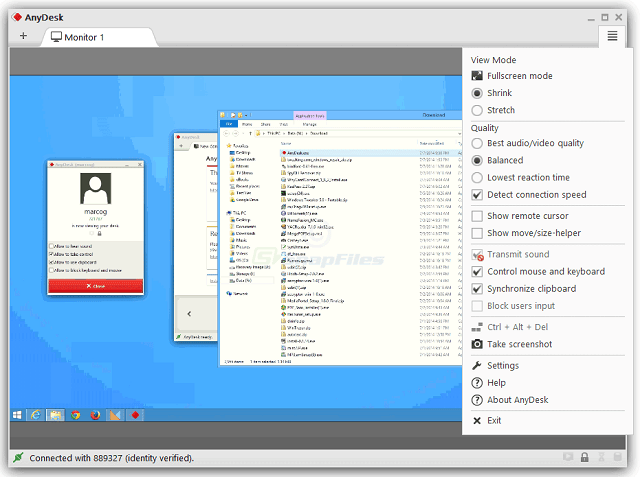 It can be used for remote access, meetings, and even supports webcam sharing over a web browser. This program is related to Java so you have to acquire it, also. Because of the Java platform, you can also use the program via the web browser. ShowMyPC premium solutions are great and can be of great use if you are keen to pay for them. 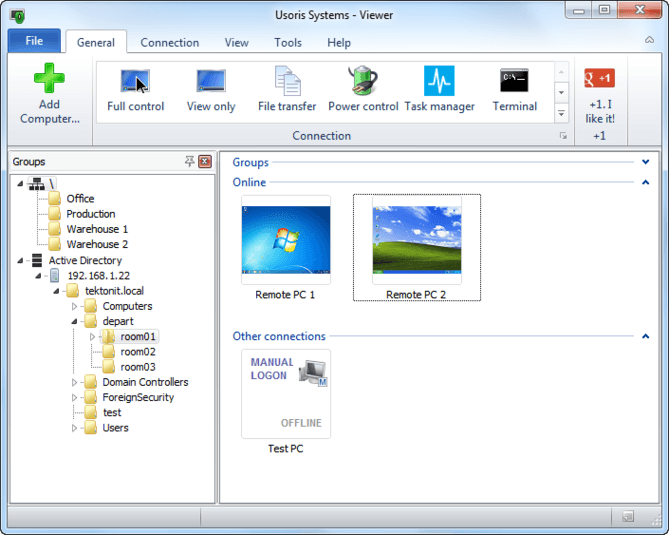 The user gets a lot of options for business and takes full remote control of multiple PCs. You can find ShowMyPC by following this link. Next on the list is AnyDesk, a program that stands somewhere in the middle when it comes to capabilities of the remote access tools. While some more advanced programs ask for router forwarding and overriding, that is not the case with AnyDesk. It is easy to use and completely free. Just like a few of the programs listed above, it can be started portably or installed. According to your selection, you will either get random ID numbers or password based on your PC name. The connection is easily obtainable in a few steps, so you won’t lose to much time. There are plenty available options that can come in handy, but support for unattended access is probably the best. It allows you to access a host PC without anyone present on the other end. Additionally, the text-chat is available, along with the keyboard shortcuts. You can get AnyDesk for free from this link. UltraVNC is an advanced tool for remote access. While the most of the other listed tools do not need router forwarding or IP address tweaking to work properly, those are mandatory for UltraVNC. This won’t be a problem for advanced users, but the users with basic needs and knowledge are going to spend some time to tune it up. Although it needs configuration, UltraVNC has a good set of options, and it’s worth trying. 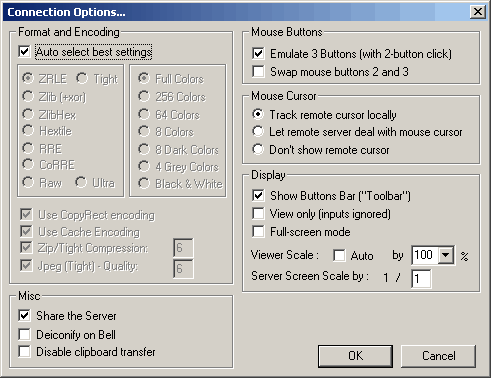 The interface is sometimes hard to use, at least until you understand the given options. To setup UltraVNC from the host PC, you ‘ll need to choose Server option. On the client PC, first, install Viewer option and then get to port forwarding configuration. Ones you finished, you ‘ll only need server IP address to connect to it. Ones the connection is acquired, you can use text chat, copy clipboard data or send keyboard shortcuts. To download UltraVNC for free, follow this link. Remote Utilities offers multiple tools integrated into one program that will assist you with all your remote access needs. The number goes up to 15 remote access solutions and modules. The connection is established with the ID and with installation-separated versions of the program on both client and host respectively. There’s no need for router forwarding or making a static IP address. By entering ID and password, you are ready to go. One of the things that distinguish this tool from others from the others is an option to run host program without displaying prompts and messages.This can be misused so be careful. To get yourself latest version of Remote Utilities for free, follow this link. These are our suggested remote access tools. We hope you will find it helpful and choose one of them for optimal results. If you have any suggestions or questions, feel free to tell us in the comments section.